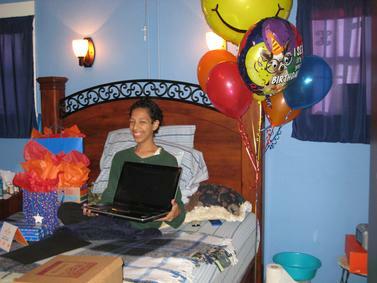 Michael wished for a Mac Laptop for music and online courses and a night out with friends. We surprised him with a digital camera and all the accessories besides the laptop with all the accessories & IWork. We first presented him his wish presents at Red Robin Restaurant in Orange, he was surprised with all his family present. Improv Brea donated tickets for him to have a night out with friends. Cinema City & In N Out donated for another night out with friends. Chick Fil A and Concourse Bowl donated another night out with friends. It was then that he was given the donated NHRA drag race tickets for the following day 11/15/08 which included 8 tickets with preferred seating. The day started with donuts and GRANTS WISHES lunch coolers filled with Subway sandwiches, chips, soda, candy etc. Craig & Eric went with them on race day which ended up being only 3 of them so they traded in the tickets for Sunday so that he could go two days. Kristhian�s wish was a rush wish.. We delivered his wish after he returned home from school. Kristhian was surprised by our arrival and anxious to open his gifts. He was thrilled when he opened the Gateway FX laptop that he had asked for and even more surprised that we had also gotten him an Itouch IPod. 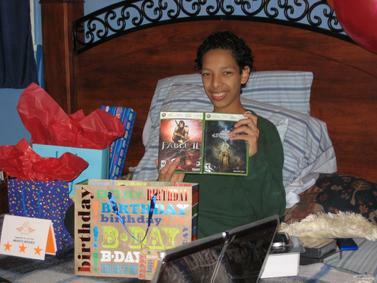 Kristhian�s 16th birthday was coming up two days later and his mother expressed how wonderful it was that we could grant his wish at this time as it would make his birthday that much better. We brought birthday balloons and a cake to help with the celebration. Corey wished to go to an Angels Game and a Big TV. His wish was granted, getting to throw out the first pitch and meet his favorite player Torii Hunter. This wish was made possible by Banco Popular in Anaheim & Sharon Jones, with the help of Angels, Baseball, Spoons in Santa Ana and Best Buy in Yorba Linda. Lawrance wished to meet professional skateboarder Rob Dyrdek and a day at Disneyland. His wish was granted but he was surprised with a remote control truck, Games and Disneyland Passes. 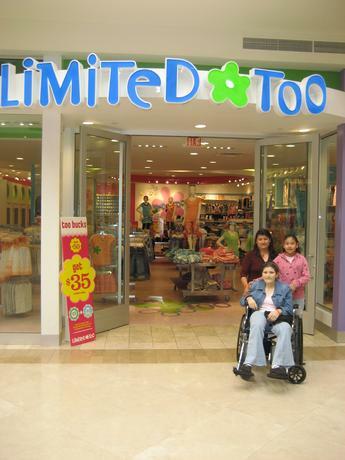 This wish was made possible by DC Shoes, Rob Dyrdek, ESPN Zone in Downtown Disney and Best Buy in Yorba Linda. Marc wished for a party! Marc was first surprised with a Hummer Limousine filled with friends and family, something he had always wished to do. Then he was surprised when he was taken to Children's Hospital of Orange County for a surprise party with all his friends, family and hospital staff. He had always wanted a big birthday party so we threw him A Celebration of Life Party. The last surprise came with his letterman jacket fully embordered with everything on it something else he had always wished for. Thanks to Starz Limousine, Sergents Sporting Goods in Whittier and CHOC for their contributions in making Marc's wish come true in every way. Bianka wished to go to Disneyland with her entire family. Her wish was granted with the help of Portifino Inn & Suites. Eriana wished for a Barbie Jeep and to be a Princess. 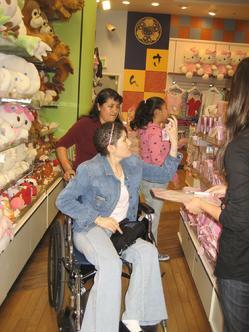 Her wish was granted with everything Princess toys, games, TV & DVD player. Jose wished to make music. He was surprised with a soft touch keyboard, softward and headphones. Thanks to Guitar Center in El Toro for their help and support. Briana wished for a bike and a big TV. 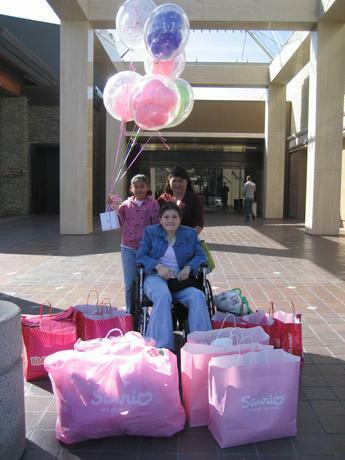 Her wish was granted and she was surprised with lots of clothes, DVD's and more. Thanks to Best Buy in Yorba Linda. Frank wished for a big TV. His wish was granted and he was surprised with games, games and more games. Sidney wished for a laptop and a Bratz Ice Cream Maker. Her wish was granted and she was surprised with a Wii, Guitar Hero, Games, Toys and all the accessories. He was surprised with lots of Sponge Bob toys, bedding, remote control cars and truck and lots of games. Adrian wished for Playstation III. He was surprised with guitar hero, PS3 games, Blu-ray movies, Legos, camouflage bedding and accessories. Wish made extra special by Lego Store and Best Buy in Yorba Linda. Julie wished for a laptop. She was surprised at her favorite restaurant China Palace with DVD's, Nintendo DS, Games and all the accessories. Thanks to Best Buy in Elk Grove and China Palace in Stockton. Blanca wished for a shopping spree. 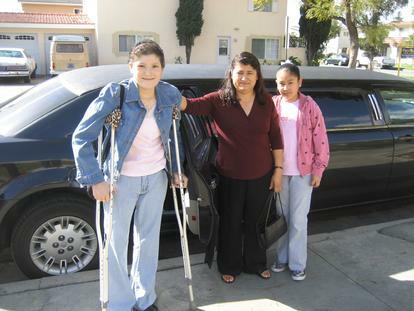 Blanca's wish was made possible with the help of So. Coast Plaza, Limited Too, Sanrio, Rainforest Cafe and Starz Limousine. Monica wished for a laptop. She was surprised with a digital camera, Comedy DVD's, Printer and all the accessories! Thanks to Best Buy in Tustin for making Monica's wish extra special. Pedro wished for a guitar! Pedro surprised us strumming a few songs for us and the hospital staff present. He was surprised with an acoustic guitar and a Electric Guitar, portable DVD player, music DVD's, play books and all the accessories. Guitar Center in Lake Forest and Best Buy in Yorba Linda helped to make Pedro's wish awesome. Francisco wished for a big TV. He was surprised with a stand and home theatre system.